Our Site focuses on marketing luxury real estate, homes and properties. 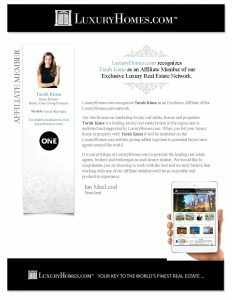 Tarah Kuna is a leading luxury real estate broker in the region and is endorsed and supported by LuxuryHomes.com. When you list your luxury home or property with Tarah Kuna, it will be marked on the Luxury Homes.com website giving added exposure to potential buyers and agents around the world. It Is our privilege at LuxuryHomes.com to promote the leading real estate agents, brokers and brokerages in each luxury market. We would like to congratulate you on choosing to work with the best and we truly believe that working with any of our affiliate members will be an enjoyable and productive experience. BTW…List with me, I care and try harder than most to market my client’s luxury homes.